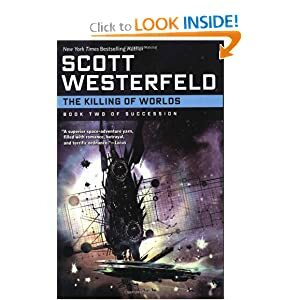 Can you believe there was a Scott Westerfeld series I had not yet read? I couldn’t either. 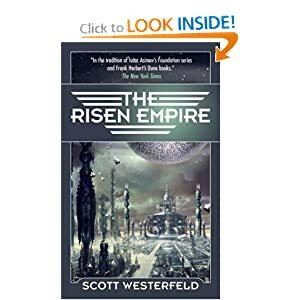 Scott Westerfeld usually writes young adult books, but these are science fiction and don’t fall into the young adult category. So, you get no parental blurb on these. I’ll admit it, I had to start the first book book twice. The beginning really threw me off. I’m a sci-fi fan, but I’m not particularly interested in battles and such. So, the beginning was difficult for me to get through. I thought, “There is absolutely no way I’m going to like this book.” But the second time I tried to read it, I pressed through the beginning battle. I’m glad I did. Because I actually ended up really liking the book. Though I will tell you, my eyeballs glazed over when it got into battle or tactile detail. I’m such a girl about some things. The second book wasn’t as hard to get into as the first. Mostly because I knew where the story was going and had wrapped my head around the micro-machine aspect of the fighting stuff. The second book had much more of the love story of the main characters in it, though it wasn’t too very sappy or girly. All in all, a good series. I gave the books 4 out of 5 stars.